The ‘Bluecoat School’, or Christ’s Hospital School, was housed on Newgate Street in the City of London until 1902. Crowe recorded in his diary on 22 September 1902 that this picture was sold at Christie’s as part of the collection of the late William Waring of London. It was auctioned again on 26 April 1937 in London, fetching £6 16s 6d. It has been in the possession of the same American family ever since. A copyright certificate for ‘Blue Coat Boys dated 24 October 1871, exists in the archives of the University of Wales, Bangor (Garthewin Additional Collection of manuscripts [1586 (i)]), which may refer to this painting. ‘Bob-Cherry’ was dated 1871 in the auction of 1937. 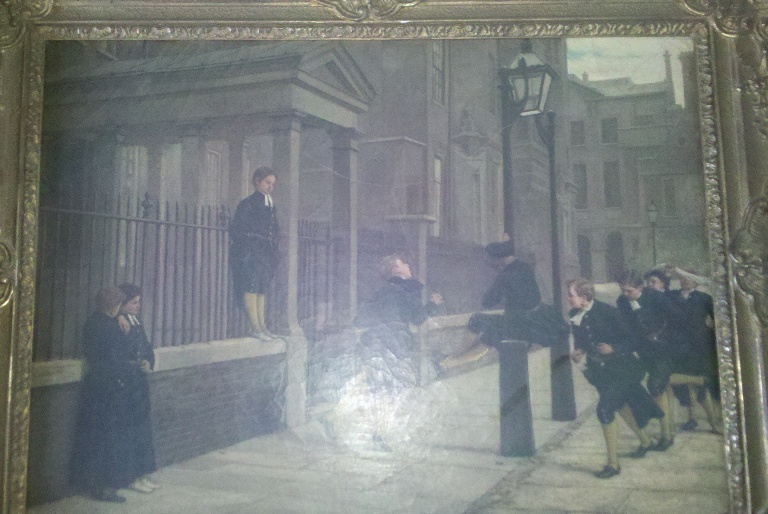 ‘Bob-Cherry’ (214) depicts boys playing at the well-known game; the prizes are slung between a lamp-post and a pillar of the portico opening to their school, the Bluecoat School; the lads follow each other in a line, and take turns to jump and bite, or miss. Of the spectators, one, with all the energy of a boy, clasps the lamp-post and clambers up it; two, of more ‘philosophical’ minds, lean against the neighbouring iron railings, and speculate on the winner; another, perched on the parapet, also looks on at the game, but with more zest for the sport. All these figures are beautifully drawn, the faces being remarkable in that respect, and the draperies are thoroughly understood, and mastered with most scrupulous care. The actions are rendered with consummate spirit, and are the result of rare powers of observation. The design tells the story in the most enjoyable manner, and with perfect simplicity and vivacity. Although the picture lacks warmth of colour, and is somewhat deficient in depth of tone, it is not difficult to overlook such shortcomings, where there is so much sound, clear, precise, and delicate handling, and where the defects are of a negative rather than of a positive character. Painted biography and history are likely to prove less popular, as we have no doubt Mr. E. Crowe can tell us, than these pleasant little pictures of Bluecoat boys at their sports, with their blue skirts tucked up for bob-cherry (214)… it is pleasant to have proof in Mr. Crowe’s pictures that the Bluecoat boys can play, for all their cumbersome garb and their city habitat. I emailed but, it’s possible it didn’t go through. I believe I may have this painting and was hoping to get some more info. It’s been in my family since at least 1940. Let me know if anyone has any info about it. Thanks!